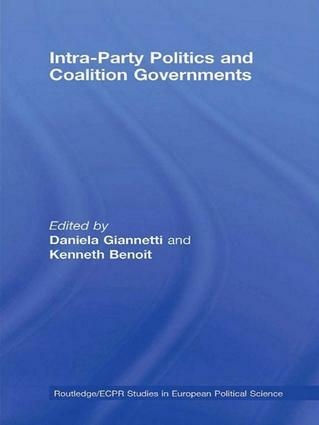 This book explores how intra-party politics affects government formation and termination in parliamentary systems, where the norm is the formation of coalition governments. The authors look beyond party cohesion and discipline in parliamentary democracies to take a broader view, assuming a diversity of preferences among party members and then exploring the incentives that give rise to coordinated party behaviour at the electoral, legislative and executive levels. The chapters in this book share a common analytical framework, confronting theoretical models of government formation with empirical data, some drawn from cross-national analyses and others from theoretically structured case studies. A distinctive feature of the book is that it explores the impact of intra-party politics at different levels of government: national, local and EU. This offers the opportunity to investigate existing theories of coalition formation in new political settings. Finally, the book offers a range of innovative methods for investigating intra-party politics which, for example, creates a need to estimate the policy positions of individual politicians inside political parties. This book will be of interest to political scientists, especially scholars involved in research on political parties, parliamentary systems, coalition formation and legislative behaviour, multilevel governance, European and EU politics.